Background: Natural compounds with therapeutic potential have been explored as antitumoral agents, as curcumin (CUR), a substance which has activity against various tumor types and a tool used to improve the action of these compounds is the production of analogs. Objective: In this study, we investigated the antitumoral activity of AC13, a CUR analog. Materials and Methods: Cytotoxicity of AC13 and CUR for different cancer cell lines was analyzed by MTT assay after 24, and 48 h of exposure and caspases 3 and 7 enzymatic activity in CasKi and human spontaneously transformed immortal keratinocyte cell line cells was analyzed after 24 h of incubation with AC13 or CUR at 50 μM. Results: It was observed significant viability loss only for CasKi cells after incubation with AC13. Hence, it was made a more detailed screening of the cytotoxicity for these cells and nontumoral cells incubated with AC13 or CUR, showing concentration-dependent decrease of cell viability. Posteriorly, AC13 induces increase in the caspases activity in both cell lines, being that for tumor cells this increase was greater than that unleashed by CUR. Conclusion: Therefore, AC13 triggers cell death by apoptosis in CasKi and shows greater effect than CUR for these tumor cells, suggesting to be a promising compound for the treatment of cancer and should be studied more thoroughly. Abbreviations used: CUR: Curcumin; TLC: Thin-layer chromatography; DMSO: Dimethyl sulfoxide; Caski: Human cervical carcinoma cell line; HeLa: Human cervical carcinoma cell line; MDA-MB-231: Human breast adenocarcinoma cell line; 786-O: Human renal cell adenocarcinoma cell line; HaCaT: Human spontaneously transformed immortal keratinocyte cell line; DMEM: Dulbecco Modified Eagle Medium; DOXO: Doxorubicin; CLO: Bisphosphonamidate clodronate; U2-OS: Human osteosarcoma cell line; FLLL32: Cell-permeable analog of curcumin; BDMC-A: Analog of curcumin. AC13 CUR semisynthetic derivative compound induces cell death by caspases activation, showing a greater effect in apoptosis induction than CUR in CasKi cervical carcinoma cell line. AC13 was less cytotoxic and caused no significant increase of caspase activation when compared to CUR in HaCaT cell line. Cancer arises from the abnormal cells with uncontrolled proliferation that can affect any part of the body and sets a leading cause of death worldwide, being estimated an increase in the number of annual cases of 14 million in 2012 to 22 million in the next two decades. Traditional available treatments are chemotherapy, radiotherapy, and surgery, which cause strong physiological stress and intense emotional vulnerability in patients. Therefore, researches that aimed the prevention, early detection and effective treatments for this disease are of great importance. A strategy to improve the pharmacological activity of phytochemicals as CUR is the production of synthetic analogs and there are many studies which report CUR analogs with better antitumor activity than CUR.,,, In addition, the focus on synthetic compounds has increased due to difficulties that natural products exhibit, as the accessibility of these materials (seasonality of certain plants, e.g.,), low amount of available compound (not allowing large-scale production), economic issue (patentability laws), and ecological issue (resupply of the species may be insufficient compared to intensive use). In the present study, we investigated the antitumoral activity of AC13, a brominated CUR analog by cytotoxicity analysis in vitro of this compound in different tumor cell lines and its effect in cell apoptosis by analysis of the caspases 3 and 7 activities. Synthesis of AC13 has been achieved by aldol condensation, using general procedure reported by Yadav and co-authors. Briefly, 7 mmol acetone was added to a solution of 14 mmol of 4-bromobenzaldehyde in ethanol (10 mL). The solution was stirred at room temperature for 20 min, followed by drop-wise addition of ethanolic solution of NaOH (1.5 mL, 1.0 mol/L). The mixture was stirred at room temperature and monitored by successive thin-layer chromatography analyses. When the reaction was finished, the residue was poured into crushed ice, resulting in precipitate, which was removed by filtration, washed with cold water, and purified by chromatography over silica gel using mixtures of hexane and ethyl acetate as eluents. After chemical procedures, AC13 was obtained in 75% yield. For bioassays, AC13 was dissolved in Dimethyl sulfoxide (DMSO) (Sigma-Aldrich, St. Louis, MO, USA). Cell lines were incubated with appropriate culture medium at different concentrations of AC13. Cells incubated with commercial CUR (Sigma Aldrich, St. Louis, MO, USA) and untreated cells, incubated with culture medium containing only DMSO, were used as positive and negative controls, respectively. Four tumor cell lines of cervical (CasKi and HeLa), human breast adenocarcinoma cell line (MDA-MB-231), and renal (786-O) cancer, and a human spontaneously transformed immortal keratinocyte cell line (HaCaT) were used in this study. All cell lines were cultured in a humidified incubator at 37°C with 5% CO2 and maintained in appropriate cell culture medium (Gibco by Life Technologies, Grand Island, NY, USA) supplemented with 10% fetal bovine serum, 100 U/mL penicillin (Invitrogen, Grand Island, NY, USA), and 100 mg/mL streptomycin (Invitrogen, Grand Island, NY, USA). 786-O cells were incubated in RPMI-1640 medium, and Dulbecco's Modified Eagle Medium medium was used for the other cell lines. Experiments were performed in triplicates and two independent assays using the density of 0.75 × 104 cells/well in 96-well plates. AC13 cytotoxicity in different cell lines was assessed by MTT assay, which is a colorimetric assay that measures cell viability by mitochondrial activity. All the cell lines were incubated for 24 and 48 h with AC13 and CUR. Cells were also incubated with doxorubicin (DOXO) (Sigma-Aldrich, St. Louis, MO, USA), which was used as positive control of cell death. In appropriate experimental times, the culture medium of each well was replaced by 100 μL MTT solution (1 mg/mL 3- [4,5-dimethylthiazol-2-yl]-2,5-diphenyl-tetrazolium bromide in culture medium) (Sigma-Aldrich, St. Louis, MO, USA). After 30 min of incubation, this medium was removed, and 100 μL/well DMSO (Sigma-Aldrich, St. Louis, MO, USA) was added to dissolve the formazan crystals. Absorbance was measured at 570 nm. Cytotoxicity was considered significant when the viability of treated cells was below 80%. As AC13 semisynthetic derivative compound showed dose-dependent cell viability in CasKi and HaCaT cells, the apoptosis was evaluated by apoptosis luminescent assay using Caspase-Glo® 3/7 Reagent (Promega, Madison, WI, USA). Both cell lines were exposed to AC13 or CUR for 24 h and posteriorly, 100 μL Caspase-Glo® 3/7 Reagent was added in each well. Then, the plate was subjected to shaking for 30 s and incubated 1 h at room temperature. Finally, the plate followed for reading the luminescent signal of each sample. Statistical analysis was performed by means of GraphPad Prism 5 Software (GraphPad Software, San Diego, CA, USA) using analysis of variance followed by an appropriate posttest. Differences were considered to be statistically significant when P < 0.05. The structure of AC13 was identified by 1H NMR and 13C NMR spectra data analyses [Figure 1]a and [Figure 1]b respectively] and compared with previous data. The most characteristic signals observed in the 1H NMR spectrum, were those of the olefinic double bond hydrogens (H-α and H-β), which were present as a pair of doublets with coupling constants of 16.2 Hz, indicating the trans configuration. In the 13C NMR spectrum, the most characteristic signal corresponds to carbonyl carbon (C = O, 188.4 ppm). Furthermore, all NMR parameters corresponded with the proposed structure [Figure 1]c. NMR spectra, at 25°C, were recorded at 600 MHz for 1H nucleus and 150 MHz for 13C nucleus on Bruker Avance III spectrometer. Chemical shifts are given in ppm on the δ scale referenced to residual CHCl3 signal at 7.28, and coupling constants (J) are calculated in hertz (Hz). 13C NMR (150 MHz; CDCl3), δC in ppm: 124.9 (C-4), 125.7 (C-α), 129.8 (C-2), 132.3 (C-3), 133.6 (C-1), 142.2 (C-β) and 188.4 (C = O). AC13 semisynthetic derivative compound and CUR cytotoxicity were analyzed at 1.25, 2.5, 5, 10, 20, 40, 80, and 160 μM In HeLa, MDA-MB-231 and 786-O cell lines in this study. AC13 was significantly cytotoxic only at 160 μM so that, the cell viability was maintained around 80% until 80 μM for these cell lines. On the other hand, exposure of these cell lines to CUR resulted in a greater viability decrease, showing significant cytotoxicity from the concentration of 20 μM [Figure 2]. For CasKi cells, viability loss exerted by AC13 was higher and because this, was made a screening more detailed of cytotoxicity of this compound and CUR for this cell line, which included the concentrations of 5, 10, 15, 20, 25, 30, 35, 40, 50, 75, 100, and 125 μM. Simultaneously, nontumor HaCaT cells were incubated with AC13 or CUR at the same concentrations. For both cell lines, although CUR was more cytotoxic, both AC13 and CUR resulted in dose-dependent decrease of cell viability. After 24 h of incubation with CUR, viability of CasKi and HaCaT cells decreased significantly from the concentrations of 30 μM and 15 μM, respectively, while exposure to AC13 showed significant cytotoxicity at 50 μM for CasKi cells and 75 μM for HaCaT cells [Figure 3]. By means of nonlinear regression analysis, the CC50 values, after 24 h, were calculated as 61.05 μM for AC13 and 53.70 μM for CUR in CasKi cells. In HaCaT cells, the CC50 values, after 24 h, were calculated as 77.14 μM for AC13 and 19.04 μM for CUR. DOXO was used at 2.5, 5, and 10 μM, showing high cytotoxicity since the lowest concentration used (2.5 μM), leading viability loss over 50% and 80% for CasKi and HaCaT cells, respectively, in 24 h (data not shown). Thus, DOXO already exerts greater cytotoxicity in a much lower concentration than AC13 and CUR. AC13 incubation induced an increase in the caspases activity of 401.8% compared to control cells and 268.9% compared to cells exposed to CUR in CasKi cells. 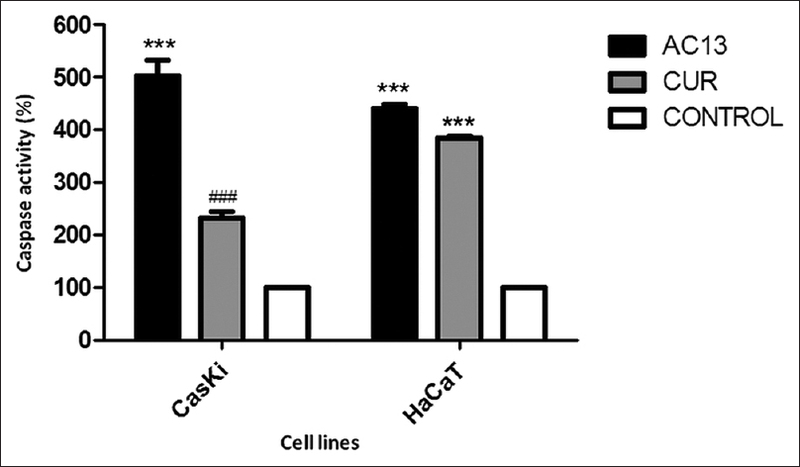 For HaCaT cells, these values were 339.9% and 55.2%, respectively [Figure 4]. Therefore, the results indicate that AC13 triggers cell death by apoptosis in these cell lines and the increase in the caspases activities is significantly higher after incubation with AC13 than CUR in CasKi cells (P < 0,001), while this difference is no significant in HaCaT cells. Compounds isolated from plants have had their anticancer potential explored and were approved for clinical use, such as paclitaxel which is one of the current treatments available and commonly used for breast cancer and vinca alkaloids such as vincristine and vinblastine which exhibit antineoplastic activity against a variety of cancers.,,, In this context, CUR has interesting anticancer properties, and although its action varies according to the cell type, it exhibits cytotoxicity against a diversity of tumor cells. Hence, the development of synthetic analogs based on CUR, which have shown great potential for cancer treatment is an alternative strategy to exploit the antitumor activity of natural compounds as CUR. CUR analog B19, for example, inhibited processes as cell proliferation and migration, presenting potent anti-angiogenic effect in vitro and ex vivo. In this study, CUR cytotoxicity induced dose-dependent decrease of the viability of CasKi, HeLa, MDA-MB-231, and 786-O cells. On the other hand, CUR semi-synthetic derivative AC13 did not show a significant cytotoxic effect in HeLa, MDA-MB-231, and 786-O cells. In other study, using different CUR synthetic analogs was observed that most compounds tested in human osteosarcoma cell line (U2-OS) were less effective than CUR, while B114, A111, and A113 were more cytotoxic. However, when these synthetics were evaluated in other tumor cell lines, the first compound presented wide antiproliferative activity while the 2nd exerted cytotoxicity to a smaller number of cell lines and the third was cytotoxic in only two cell lines. Hence, the cytotoxicity of synthetic compound can vary among different cell lines and interestingly, the AC13 compound showed higher cytotoxicity in CasKi cells compared to others tumor cell lines, suggesting a certain selectivity for this cell line. It was reported that a series of synthetic compounds tested on a tumor cell lines panel from different histologies showed selective cytotoxicity for kidney and breast cancer cells, while bisphosphonamidate clodronate prodrug demonstrated selective cytotoxicity against three out of six melanoma cell lines., HaCaT cells were also showed a dose-dependent decrease of cell viability when exposed to AC13 and CUR. 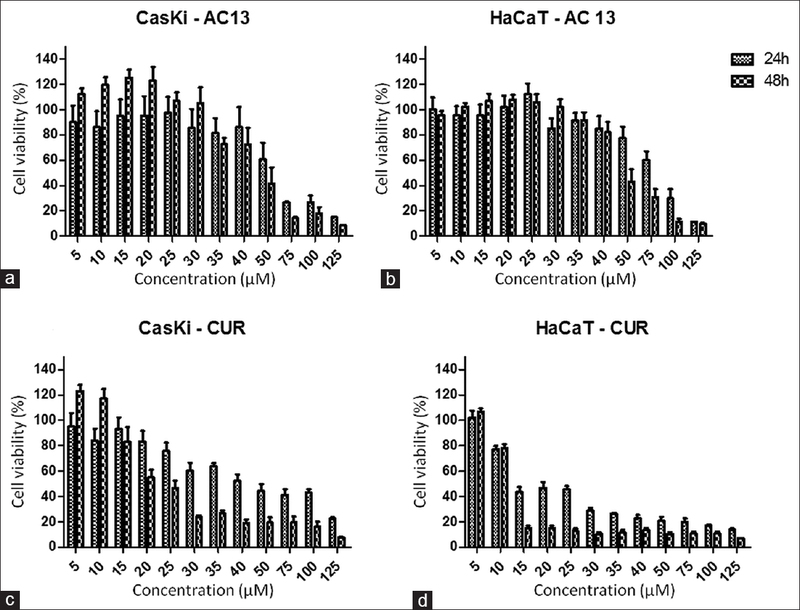 However, AC13-induced less cytotoxicity than CUR in HaCaT cells, suggesting that the semi-synthetic derivative AC13 has selective cytotoxicity between cervical cancer cell line (CasKi) and normal keratinocytes (HaCaT). 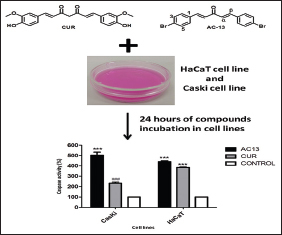 The induction of apoptosis in CasKi and HaCaT cells after incubation with AC13 or CUR was evaluated by analysis of the caspases 3 and 7 enzymatic activities. In this test, both cell lines were treated for 24 h with the compounds at 50 μM. The choice of the experimental conditions for this step was based on the optimization of the assay that was observed at this concentration and incubation time. AC13 compound increased significantly caspase 3 and 7 activities, especially in CasKi cells compared to control cells. Others CUR analogs also induced apoptosis by increased caspase activity, such as MS17 in two androgen-independent metastatic human prostate cancer cell lines, PC-3 and DU 145. Furthermore, although the viability assay reveals that at a concentration of 50 μM the CUR cytotoxicity is >AC13 cytotoxicity for both cell lines, activity induction of caspases by AC13 was higher in relation to CUR for CasKi and HaCaT cells. This difference may be due to the fact that detection assay of caspases 3 and 7 activities indicates apoptosis, while viability decrease may be the result of more than one cell death type. For example, it was observed the occurrence of autophagic cell death in human malignant glioma cells after CUR exposure. However, it is interesting to note that the increase in caspases activities by AC13 was significantly higher than observed for CUR in the tumor cell line, while this difference was not significant in the nontumoral cell line. In human breast cancer cell, MCF-7, the CUR analog of curcumin-A also caused caspases activation, and it was more potent than CUR in inducing apoptosis. The data suggest that AC13 CUR semi-synthetic derivative compound induces cell death by caspases activation, showing a greater effect in apoptosis induction than CUR in CasKi cervical carcinoma cell line. In addition, AC13 was less cytotoxic and caused no significant increase of caspase activation when compared to CUR in HaCaT cell line. Thus, our study suggests that AC13 compound is a promising candidate for cancer treatment, but further studies are necessary to confirm its anticancer properties. This work was supported by the São Paulo Research Foundation (FAPESP), Brazil. Grant number 2014/04395-2. World Health Organization. Data and Analysis on Cancer Mortality and Morbidity. Switzerland: World Health Organization; 2015. Brown MR, Ramirez JD, Farquhar-Smith P. Pain in cancer survivors. Br J Pain 2014;8:139-53. Visvader JE. Cells of origin in cancer. Nature 2011;469:314-22. Lee JH, Khor TO, Shu L, Su ZY, Fuentes F, Kong AN, et al. Dietary phytochemicals and cancer prevention: Nrf2 signaling, epigenetics, and cell death mechanisms in blocking cancer initiation and progression. Pharmacol Ther 2013;137:153-71. Perrone D, Ardito F, Giannatempo G, Dioguardi M, Troiano G, Lo Russo L, et al. Biological and therapeutic activities, and anticancer properties of curcumin. Exp Ther Med 2015;10:1615-23. Guo LD, Chen XJ, Hu YH, Yu ZJ, Wang D, Liu JZ, et al. Curcumin inhibits proliferation and induces apoptosis of human colorectal cancer cells by activating the mitochondria apoptotic pathway. Phytother Res 2013;27:422-30. Aggarwal BB, Kumar A, Bharti AC. Anticancer potential of curcumin: Preclinical and clinical studies. Anticancer Res 2003;23:363-98. Lien JC, Hung CM, Lin YJ, Lin HC, Ko TC, Tseng LC, et al. Pculin02H, a curcumin derivative, inhibits proliferation and clinical drug resistance of HER2-overexpressing cancer cells. Chem Biol Interact 2015;235:17-26. Wu J, Cai Z, Wei X, Chen M, Ying S, Shi L, et al. Anti-lung cancer activity of the curcumin analog JZ534 in vitro. Biomed Res Int 2015;2015:504529. Padhye S, Chavan D, Pandey S, Deshpande J, Swamy KV, Sarkar FH, et al. Perspectives on chemopreventive and therapeutic potential of curcumin analogs in medicinal chemistry. Mini Rev Med Chem 2010;10:372-87. Yadav B, Taurin S, Rosengren RJ, Schumacher M, Diederich M, Somers-Edgar TJ. Synthesis and cytotoxic potential of heterocyclic cyclohexanone analogues of curcumin. Bioorg Med Chem 2010;18:6701-7. Reddy NSK. Synthesis, characterization and nonlinear optical properties of symmetrically substituted dibenzylideneacetone derivatives Chem Phys Lett 2014;616:142-7. Lee CT, Huang YW, Yang CH, Huang KS. Drug delivery systems and combination therapy by using vinca alkaloids. Curr Top Med Chem 2015;15:1491-500. Pan L, Chai HB, Kinghorn AD. Discovery of new anticancer agents from higher plants. Front Biosci (Schol Ed) 2012;4:142-56. Safarzadeh E, Sandoghchian Shotorbani S, Baradaran B. Herbal medicine as inducers of apoptosis in cancer treatment. Adv Pharm Bull 2014;4:421-7. Zeichner SB, Terawaki H, Gogineni K. A review of systemic treatment in metastatic triple-negative breast cancer. Breast Cancer (Auckl) 2016;10:25-36. Kuttan G, Kumar KB, Guruvayoorappan C, Kuttan R. Antitumor, anti-invasion, and antimetastatic effects of curcumin. Adv Exp Med Biol 2007;595:173-84. Sarkar FH, Li Y, Wang Z, Padhye S. Lesson learned from nature for the development of novel anti-cancer agents: Implication of isoflavone, curcumin, and their synthetic analogs. Curr Pharm Des 2010;16:1801-12. Sun L, Liu J, Lin SS, Shi WT, Zhu J, Liang G, et al. Potent anti-angiogenic activity of B19 – A mono-carbonyl analogue of curcumin. Chin J Nat Med 2014;12:8-14. Pan Z, Chen C, Zhou Y, Xu F, Xu Y. Synthesis and cytotoxic evaluation of monocarbonyl analogs of curcumin as potential anti-tumor agents. Drug Dev Res 2016;77:43-9. Webster MR, Kamat C, Connis N, Zhao M, Weeraratna AT, Rudek MA, et al. Bisphosphonamidate clodronate prodrug exhibits selective cytotoxic activity against melanoma cell lines. Mol Cancer Ther 2014;13:297-306. Wei L, Malhotra SV. 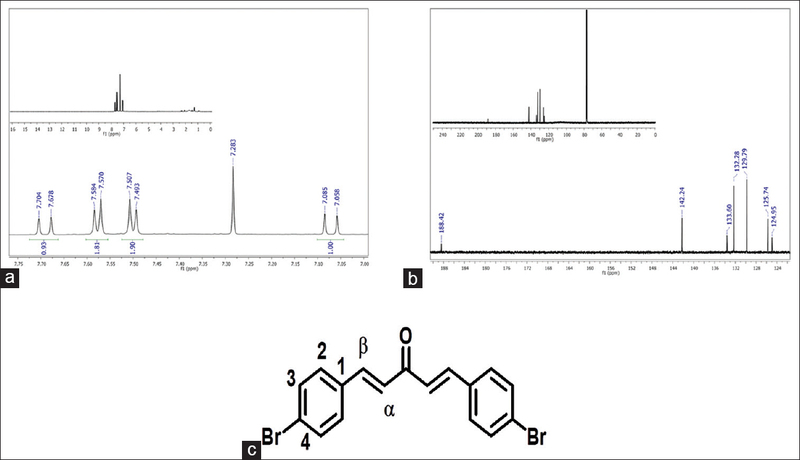 Synthesis and cytotoxicity evaluation of novel pyrido[3,4-d] pyrimidine derivatives as potential anticancer agents. Medchemcomm 2012;3:1250-7. Goldar S, Khaniani MS, Derakhshan SM, Baradaran B. Molecular mechanisms of apoptosis and roles in cancer development and treatment. Asian Pac J Cancer Prev 2015;16:2129-44. Delbridge AR, Valente LJ, Strasser A. The role of the apoptotic machinery in tumor suppression. Cold Spring Harb Perspect Biol 2012;4. pii: a008789. Bill MA, Fuchs JR, Li C, Yui J, Bakan C, Benson DM Jr., et al. The small molecule curcumin analog FLLL32 induces apoptosis in melanoma cells via STAT3 inhibition and retains the cellular response to cytokines with anti-tumor activity. Mol Cancer 2010;9:165. Lv ZD, Liu XP, Zhao WJ, Dong Q, Li FN, Wang HB, et al. Curcumin induces apoptosis in breast cancer cells and inhibits tumor growth in vitro and in vivo. Int J Clin Exp Pathol 2014;7:2818-24. Galluzzi L, Morselli E, Kepp O, Kroemer G. Targeting post-mitochondrial effectors of apoptosis for neuroprotection. Biochim Biophys Acta 2009;1787:402-13. Walsh JG, Cullen SP, Sheridan C, Lüthi AU, Gerner C, Martin SJ, et al. Executioner caspase-3 and caspase-7 are functionally distinct proteases. Proc Natl Acad Sci U S A 2008;105:12815-9. Singh M, Singh N. Molecular mechanism of curcumin induced cytotoxicity in human cervical carcinoma cells. Mol Cell Biochem 2009;325:107-19. Paulraj F, Abas F, Lajis NH, Othman I, Hassan SS, Naidu R, et al. The curcumin analogue 1,5-bis (2-hydroxyphenyl)-1,4-pentadiene-3-one induces apoptosis and downregulates E6 and E7 oncogene expression in HPV16 and HPV18-infected Cervical Cancer Cells. Molecules 2015;20:11830-60. Citalingam K, Abas F, Lajis NH, Othman I, Naidu R. Anti-proliferative effect and induction of apoptosis in androgen-independent human prostate cancer cells by 1,5-bis(2-hydroxyphenyl)-1,4-pentadiene-3-one. Molecules 2015;20:3406-30. Thayyullathil F, Rahman A, Pallichankandy S, Patel M, Galadari S. ROS-dependent prostate apoptosis response-4 (Par-4) up-regulation and ceramide generation are the prime signaling events associated with curcumin-induced autophagic cell death in human malignant glioma. FEBS Open Bio 2014;4:763-76. Mohankumar K, Pajaniradje S, Sridharan S, Singh VK, Ronsard L, Banerjea AC, et al. Mechanism of apoptotic induction in human breast cancer cell, MCF-7, by an analog of curcumin in comparison with curcumin – An in vitro and in silico approach. Chem Biol Interact 2014;210:51-63.